Pictured above from left: Shannon Hatch RiversEdge West, Teresa Nees, Sarah Wilson RiversEdge West. Teresa Nees was awarded Colorado Weed Management Association's "Weed Manager of the Year" at a recent CWMA annual conference in Grand Junction. Shannon Hatch with RiversEdge West nominated Teresa because of her work with REW and other organizations in the area to bolster invasive species management and awareness in our community. Mesa County Noxious Weed & Pest Management Coordinator Teresa Nees was recently honored by the Colorado Weed Management Association (CWMA) as the "Weed Manager of the Year" for extensive work with RiversEdgeWest (formerly the Tamarisk Coalition) and other organizations in the area to bolster invasive species management and awareness in our community. 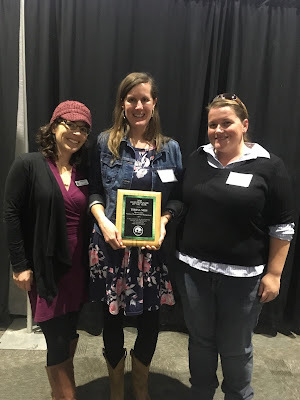 "I am honored and humbled to be given the CWMA Weed Manager of the Year award for 2018, but I would not be here without my fellow weed managers who work together to transform our valley, and landscapes around our state," said Nees. The Colorado Weed Management Association is a professional, member-based organization comprised of noxious weed managers from commercial, non-profit, and government sectors with the purpose of increasing awareness to provide education regarding invasive plant species through professional improvement and regulatory direction. "Thank you, especially to the folks close to home that submitted the nomination; Shannon Hatch with RiversEdgeWest; Melissa Werkmeister with the Bureau of Reclamation; Brian Woods with Clifton Sanitation District; Pete Firmin with Colorado Parks and Wildlife; and Travis Haldeman with Mesa County Facilities and Parks," Nees said. "These folks and others with them are unsung heroes, working diligently behind the scenes to improve the quality of life for all of us in the Grand Valley. Over the years, one can observe steady progress that their organizations have made by opening up the river corridor to allow native plant populations to re-establish and thrive, increasing plant and wildlife habitat, enhancing outdoor recreational opportunities around the valley, and cultivating a sense of ownership in our rivers and public land health," Nees added.